Kuwait’s standing as a world centre of Islamic art has been raised further by the opening of a unique exhibition examining the Islamic world’s role in the development of the foundations of modern science and technology. His Excellency Sheikh Mohammed Abdullah Al-Mubarak Al-Sabah, Minister of Information and President of the National Council of Culture, Arts and Letters, officially launched The Golden Age of the Arab Sciences exhibition at Kuwait City’s Amricani Cultural Centre this evening in the presence of local dignitaries and VIPs. 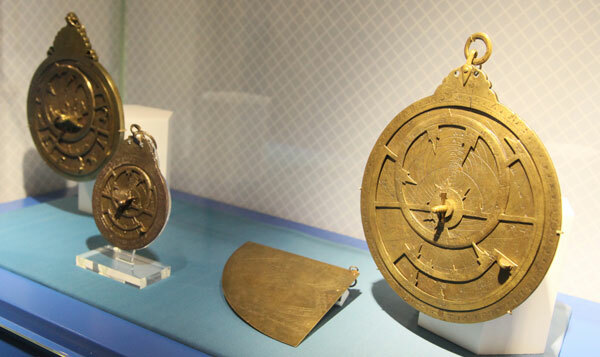 Open to the public from March 15 to June 16, the exhibition offers a fascinating insight into the application of science and technology during what is commonly referred to as the ‘golden age’ of Arab-Muslim civilisation, the period spanning the eighth and fifteen centuries C.E. (first and eighth centuries in the Islamic calendar). Hosted by Dar al-Athar al-Islamiyyah (DAI), the exhibition has been brought to Kuwait by the Institut du Monde Arabe of Paris, with the support of Total and the French embassy. The three-month exhibition features priceless items from The al-Sabah Collection of art from the Islamic world, the private collection of Sheikh Nasser Sabah al-Ahmed al-Sabah and his wife, Sheikha Hussah Sabah al-Salem al-Sabah. Joining VIP guests at the exhibition launch were Her Excellency Nada Yafi, Ambassador of France to Kuwait; Lionel Levha, General Manager of Total Kuwait; Renaud Muselier, President of the Institut du Monde Arabe; and Catherine Ferrant, Vice President of Corporate Philanthropy and General Delegate of the Total Foundation, Total’s global endowment fund. Lionel Levha of Total Kuwait said the exhibition underlined Total’s commitment to community engagement, especially in Kuwait where the company is also an active supporter of environmental conservation, in partnership with local organisations and the Total Foundation. “One of our missions at Total is to celebrate the culture of the countries where we are located, especially those in the Middle East where the group has its historical foundations,” said Catherine Ferrant, Vice President of Corporate Philanthropy at the Total Foundation. “Kuwait is an ideal location for such an exhibition, a country with a gift for science and many institutions dedicated to the subject,” said Her Excellency Nada Yafi, the French ambassador to Kuwait. From 10:00am-7:00pm Monday to Thursday and on Saturdays. The exhibition is also open from 2:00-7:00pm every Friday.